Newly Identified 'Hellboy' Dinosaur Sported Unique Horns, Scientists Say : The Two-Way The new species, a close relative of Triceratops that was discovered in Alberta, Canada, has large horns above the eyes and a crown-like frill. Artistic life reconstruction of the new horned dinosaur Regaliceratops peterhewsi in the palaeoenvironment of the Late Cretaceous ofAlberta, Canada. 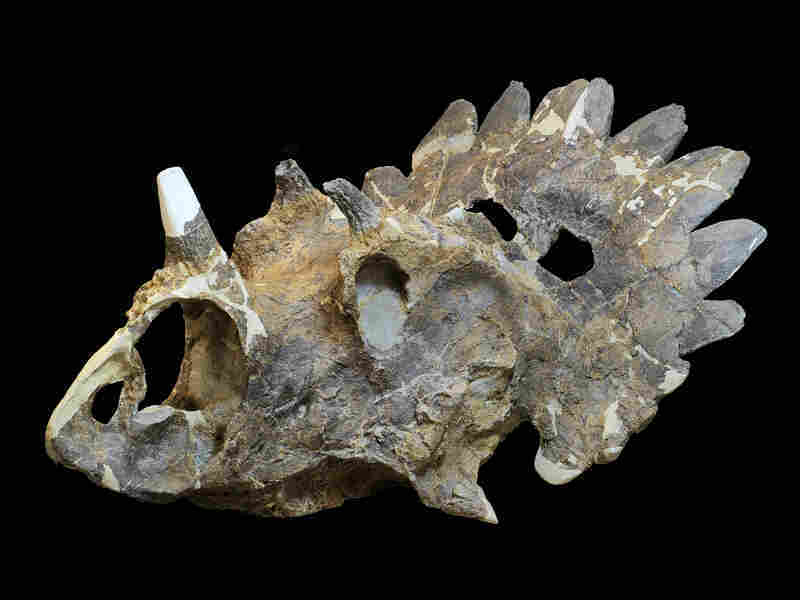 There's a new species of dinosaur, and they call him "Hellboy." Sue Sabrowski/Courtesy of Royal Tyrrell Museum, Drumheller, Alberta. Photograph of the skull of the new horned dinosaur Regaliceratops peterhewsi in oblique view. At first glance, the untrained eye is likely to see the childhood favorite Triceratops — and to be sure, Regaliceratops peterhewsi is a close relative. But there are some important differences, scientists say. The bones of the new species, which lived in the Cretaceous some 70 million years ago, were found about a decade ago near a river in southeastern Alberta, Canada. 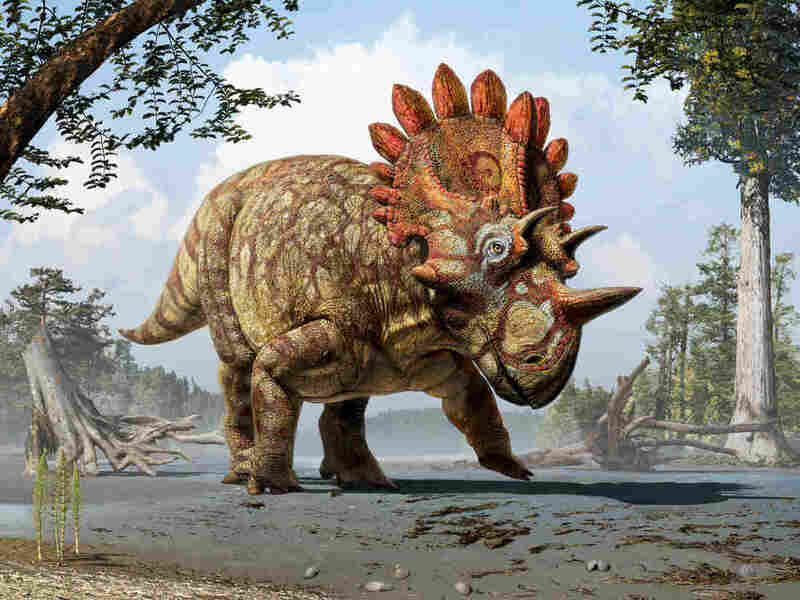 But, it wasn't until the specimen was being prepared that its unusual horns were noticed, says Caleb Brown of the Royal Tyrrell Museum of Palaeontology in Alberta. "Once it was prepared it was obviously a new species, and an unexpected one at that. Many horned-dinosaur researchers who visited the museum did a double take when they first saw it in the laboratory," he says. It acquired the nickname "Hellboy" for the horned comic-book (and film) character. According to paleontologists, the "horned dinosaurs" fall into two categories — Chasmosaurines, with a small horn above the nose and larger horns over the eyes, and Centrosaurines, with a large horn over nose and smaller "eye horns." Unlike Triceratops, "Hellboy" has almost "comically small" eye horns. Along with the new dinosaur's large shield-like frill, "the combined result looks like a crown," Brown says. "This new species is a Chasmosaurine, but it has ornamentation more similar to Centrosaurines," he says. "It also comes from a time period following the extinction of the Centrosaurines." Meaning that the two groups evolved the same features independently. "The textbooks used to show Triceratops using its horns to fend off Tyrannosaurus Rex, but the thinking has changed about that," Brown tells NPR, adding that now the weight of scientific opinion is that they were mainly a mating display. "Most of the horns would actually be pretty useless for defense," he says.